Is Dr. D Y Patil Vidyapeeth recognized by UGC and Government of India? Yes, Dr. D Y Patil Vidyapeeth is recognized by the UGC under Section 3 of the University Grants Commission, Act, 1956 and Government of India. How many colleges are under the ambit of the Vidyapeeth? What are the courses on offer? The Vidyapeeth offers Undergraduate, Postgraduate, PG Diploma, Super-specialty and Ph.D. courses in Medical, Dental, Biotechnology, Bioinformatics, Management, Nursing, Physiotherapy and Optometry. Can a student pursue his Ph.D. program here? If yes, what are the specializations? Yes, a student can pursue his/ her Ph.D. program in Medical (19 specialties), Dental (9 specialties), Biotechnology, Bioinformatics, Management (10 specialties), Nursing (4 specialties) and Physiotherapy (8 specialties). What is the admission procedure for Indian students? From February onwards, the admission forms are available. The admission advertisements are released in the National and Regional Newspapers, where all the admission details are given. Students can avail the form by sending the requisite form fees by demand draft to The Registrar, Dr. D. Y. Patil Vidyapeeth, Pune or paying the same in cash personally at the Vidyapeeth Office. One can send the form duly filled in along with requisite test fees by the Prescribed Date given in the Admission Notice. 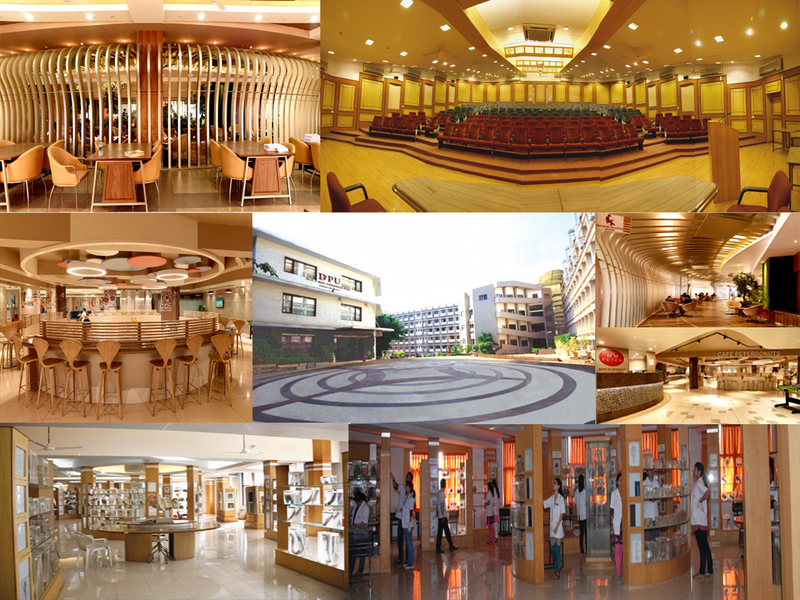 All admissions are done through Entrance Tests conducted by the Dr. D. Y. Patil Vidyapeeth, Pune. What is the admission procedure for NRI/PIO/FN students? Under the NRI, PIO and FN categories, only those students who have studied and passed the qualifying examination from schools and / or colleges located in foreign countries (all countries other than India) are considered. These includes the students studying in schools and colleges situated in the foreign countries, even if the concerned school / college is affiliated to any Board of Secondary Education or a Vidyapeeth in India. However, wards of NRIs, PIOs or FNs, who are studying for the qualifying examination in schools located in India, are excluded. Are the colleges/institutes under Dr. D. Y. Patil Vidyapeeth, Pune are recognized by the respective statutory councils? On whose name the payments are to be made? The payments are not accepted by cheque / money order. The fees payable to the Vidyapeeth should be made by demand draft drawn on any nationalized bank in favour of "The Registrar, Dr. D. Y. Patil Vidyapeeth, Pune" payable at Pune. The fees payable to the Colleges/Institutes should be drawn in their respective names. The medium of instruction in colleges/institutes is mainly English. The local language, Marathi, is especially taught to Medical and Dental students, so that it becomes easier for them to interact with OPD patients.